Following her first book "Transform Your Body after 40", released last year, Catherine Piot addresses now a wider audience. The 90 Days to a New Body book reveals a very efficient practical and easy to follow method to change anyone's physique within 12 weeks. The steps are very well detailed and well thought. The author has a Master degree in Physical education, nutrition and Gymnastic training and is master trainer and performance nutrition specialist with over 20 years of experience in helping men and women transform their bodies. My book is not just a diet or an exercise book. It's based upon science in Athletic training and this is why it works. I want men and women to look and feel better and 90 Days is what it takes to change for the rest of their lives. 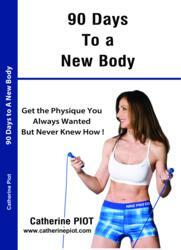 The expert fitness and nutrition coach Catherine Piot has released her new book: "90 Days to a New Body, Get the physique you always wanted but never new how!” The book is available worldwide as a digital and paperback version on Amazon and Amazon Kindle. Catherine explains: "‘Too many people try to go to the gym and lose weight or gain muscle but lack information and method to achieve noticeable results. They get quite discouraged after a while. With my step by step method they learn how to Exercise and work on Motivation and Nutrition and learn also how to increase their efforts gradually to finally achieve their goal". More information about the book is also available on Catherine’s website: http://www.catherinepiot.com and on her facebook fan page : http://www.facebook.com/catherinepiotinstitute, where you can find loads of FREE tips, advice on exercise plans, nutrition and weight loss.